For those of you looking to keep your food in portions in check this is the perfect solution. It’s not about counting calories, but rather being mindful of what a true portion size is, even for the average adult. 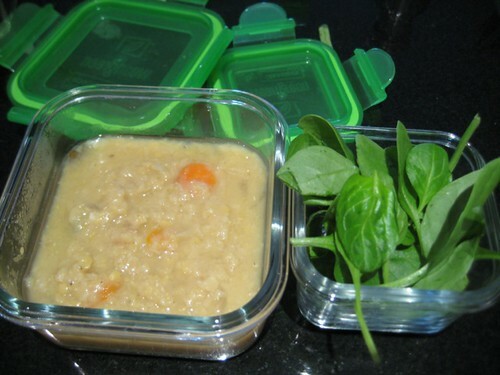 Whether your goals are lose weight or just to have an efficient metabolism a good collection of wean green containers can help you get on your way. Let’s just say. In one container you’ve got your all in one soup all ready to go. Filled with lentils and cumin and hearty veggies. Not to mention this is an all-in one meal – making it very easy for meal planning this wintertime. Then to make it more complete have some kale or another whole grain in another container and it’s all portioned out. These containers make it very easy for you to mindful with your meals while keep your personal portions in check and filled with delicious food! are warming and satisfying. Complete your soup with a bowl of basmati rice and steamed greens! This entry was written by Melissa, posted on December 7, 2011 at 4:17 am, filed under Wean Team and tagged chef, healthy eating, lentil cumin soup, marni wasserman, personal portions. Bookmark the permalink. Follow any comments here with the RSS feed for this post. Comments are closed, but you can leave a trackback: Trackback URL.